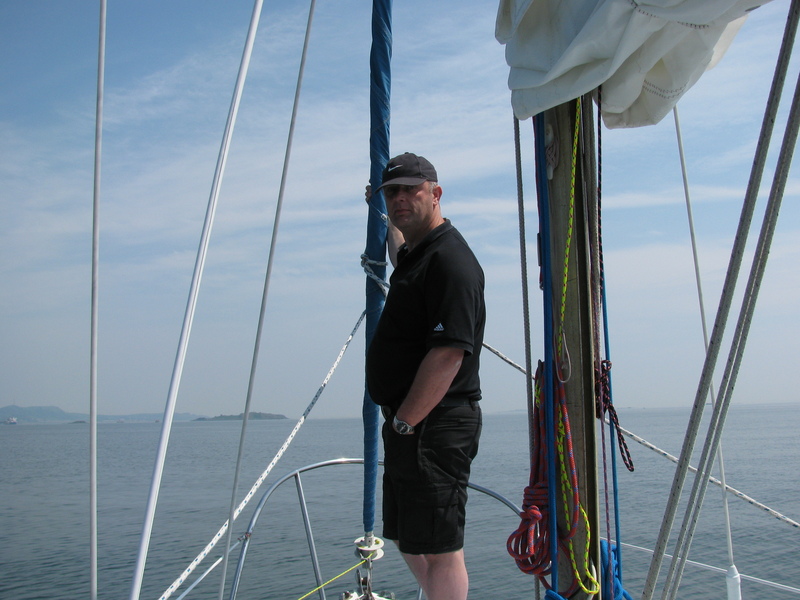 Congratulations to Rory Carter for winning the 2012 Cruising Log with his Three Canals Transit Log. 2010 Winning Cruising Log by Findlay Carter on Solveig. Joint Venture, Louise, Smuggler and Solveig set off in light winds which picked up to a nice sailing breeze later in the day. All except Solveig went ashore to Blackness for a pint, I have a report that the Best was particularly good. Unfortunatley there were no takers for this cruise, maybe next year. Armagnac, Fyne Thyme and Joint Venture sailed to Port Edgar on the Friday night. Bantiki arrived on Saturday morning. We all spent the moring and early part of the afternoon watching the parade for Ferry Fair before Armagnac, Fyne Thyme and Joint Venture set sail in a nice breeze for Cramond, as usual we were met by members of Cramond club on our arrival who lent us a couple of tenders and gave us access to the club house for use of the bar, showers etc. Before our retrun to Limekilns on the evening tide the crew of Armagnac and Jouint Venture took a bus trip into Edinburgh to have a look round some of the street performers in the Edinburgh Festival. The sail back to Limekilns took very little time with a good breeze from the North East. Cerberus and Shere Khan were in Aberdour on Friday night ahead of Armagnac, Fyne Thyme and Louise who arrived on Saturday, unfortunately engine trouble prevented Cerberus from attempting the defence of his trophy in the regatta on the Saturday. All crews ate together on Saturday night in the Cedar Inn with a few returning for a nightcap on Cerberus. Light winds meant very little sailing all weekend. Joint Venture and a crew of three were the only attendees from FCC. Annabel, Armagnac, Joint Venture, Shere Khan, Cordelle, Silver Girl, Fyne Thyme, Louise, Smuggler and Panache all in attendance. A good afternoon weather wise and the prospect of food proved too much for many of the club members, is this the future of cruising for FCC? On Saturday four boats left Limekilns on the morning tide and after a brief stop in Port Edgar to pick up crew, coffee and bacon rolls in varying quantities we set off in very changeable wind. Since the winds were from the north we anchored off Aberdour and our three younger members present followed a series of compass bearings hunting for the clues and questions to lead them to the buried treasure. Stella Maris sailed down from Port Edgar to join us for a while before returning to her berth. 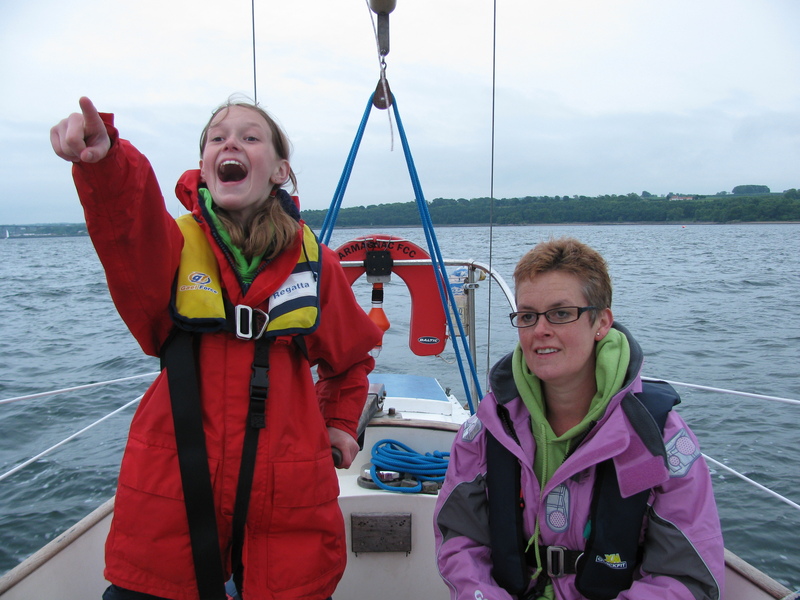 In the early evening we brought the boats in to Aberdour before gathering on board Joint Venture. On Sunday, with better weather conditions for Inchcolm we had a short stop there in the morning. We left Incholm and sailed up to the bridges in light winds where the wind dropped completely. Rather than motor around or sit at anchor until the tide came back in to Limekilns we had a refreshment stop at Port Edgar while waiting on the tide. Look out for the FCC PIRATES around the club after Saturday’s treasure hunt. Three boats set off for Port Edgar on Friday evening, Armagnac and Joint Venture enjoying a bit of a sail before the wind died. Saturday dawned with bright sunshine and light winds Joint Venture and Solvaig set off early for Elie, Armagnac leaving just after mid-day having had a supply of contact lenses delivered by Jenny Sullivan (thanks Jenny). All three boats arrived before the tide was in at Elie so we anchored off and went ashore for dinner at the Ship Inn, shore transport provided courtesy of George and his dinghy and outboard. After dinner the boats were moored up in the visitors berths in the corner of the harbour. Sunday was spent ashore, the crews of Joint Venture and Solvaig taking a bus trip to Anstruther, Armagnac had visitors so elected to stay in Elie and entertain our guests in the clubouse of the sailing club. Many thanks to the club for the use of their facilities, excellent showers, and lovely lounge where all three crews spent Sunday evening. Monday was a bit overcast but a pleasant breeze from the East meant a great sail back to Port Edgar for a visit to the Chinese Restaurant while waiting for the tide at Limekilns. 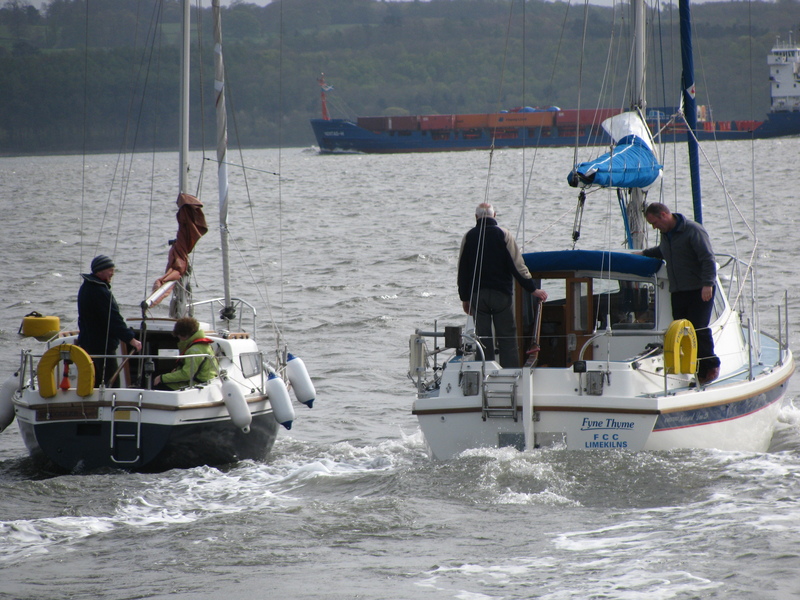 All three boats sailed back to Limekilns under head sails only, arriving back at about 9.30pm. All in all an excellent weekends sailing with some fine weather, plenty of seals, gannets and puffins to be seen and a friendly welcome from Elie Club. Armagnac and Shere Khan spent Friday night in Aberdour, the crew of Armagnac enjoying the hospitality of the Reaper while the crew of Shere Khan were in the pub. On Saturday morning Armagnac had a bit of difficulty getting the engine started but once Catherine pointed out that the fuel shut off was still pulled out we were soon underway. Running down the coast from Aberdour towards Kirkcaldy Bay, Puffin spotting, in bright sunshine and a steady breeze. Armagnac was soon passed by Shere Khan motoring to Granton for lunch , see the picture below of her skipper sporting a fine pair of shorts fashioned by Catherine with a pair of blunt scissors. Armagnac was joined by Sea Horse who had motored from Limekilns. Sea Horse hoisted her sails and joined the run down the coast. We then headed south across the Firth towards Portobello, Armagnac had a brief detour to get a better view of a porpoise swimming near one of the Leith channel buoys. We then tacked up past the south end of Inchkeith and up to Hound Point before dropping the sails and heading to Port Edgar. Sea Horse kept going and picked up the club buoy outside the harbour to wait for the tide. Armagnac motored back from Port Edgar after a short stop to stretch the legs. Shere Khan and the shorts! Three boats set off from Limekilns on Saturday morning Stella Maris joined up from Port Edgar with the plan to get to Granton for lunch. As seems to be the pattern for the cruising season so far having got down past the rail bridge the wind began to pick up, 28 knot gusts coming from the North East. Joint Venture and Solvaig made it to Granton but not until after three o’clock by which time the RFYC had finished serving lunches. Having had a late lunch on Pot Noodle they set off for the run back up to Port Edgar. Armagnac and Stella Maris returned to Port Edgar without venturing in to Granton. Stella Maris kindly hosted a gathering of all crews as they got back to Port Edgar. Sunday morning saw almost no wind with Armagnac, Joint Venture and Stella Maris heading up to Limekilns for the start of the Club Race series. 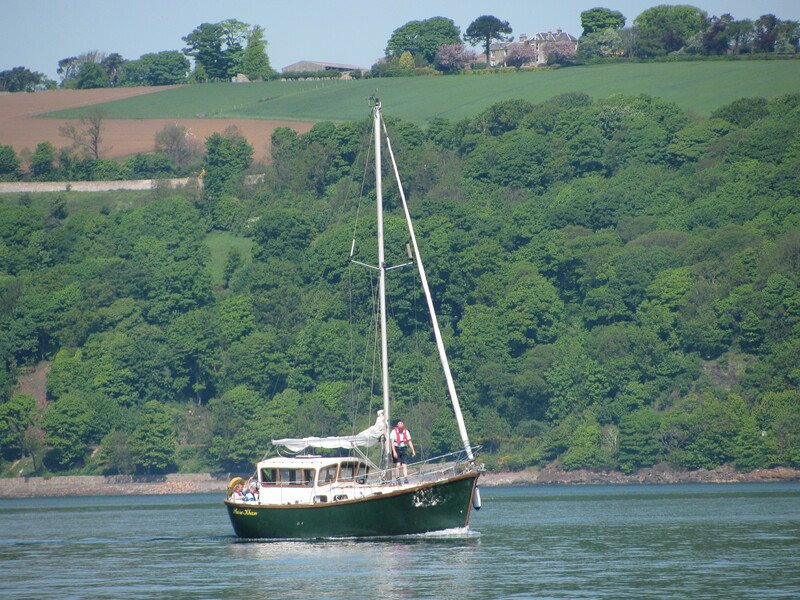 Solvaig went sailing from Port Edgar before returning to Limekilns later in the day. Another windy afternnoon (25 knots North Easterly) saw three boats out of the harbour for a quick trip towards Blackness and back to Town Pier. Fyne Thyme pausing to recover a fender floating in the water before resuming a chase of Solvaig. 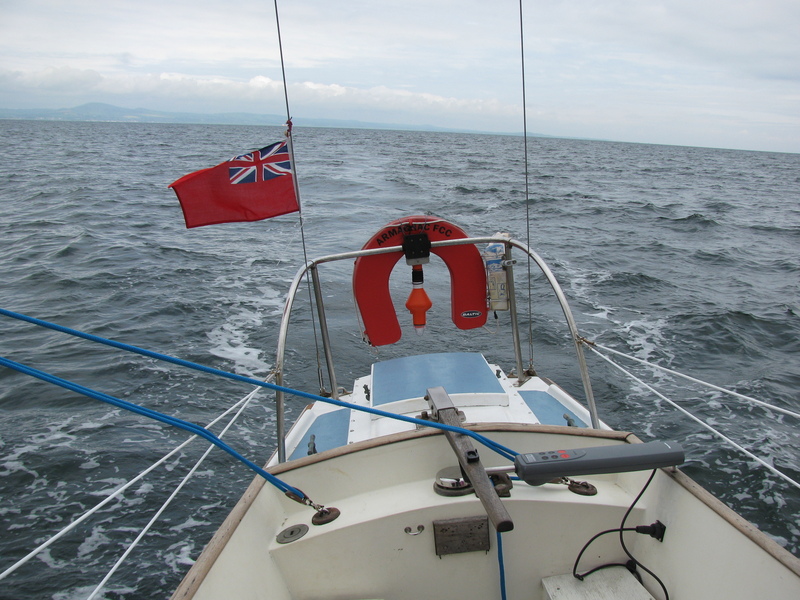 The 17th April got the season off to a bit of windy start with 30 plus knots of wind. Two boats took to the water Cerberus and Joint Venture for a brisk sail up river towards Bo’ness and a quick run back down. Joint Venture returning to Limekilns with Cerberus heading to Port Edgar for a chilly overnight stay and a fine sail on Sunday down to Inchcolm before returning to Limekilns on Sunday afternoon. Five boats joined the final cruise of the season to Blackness. 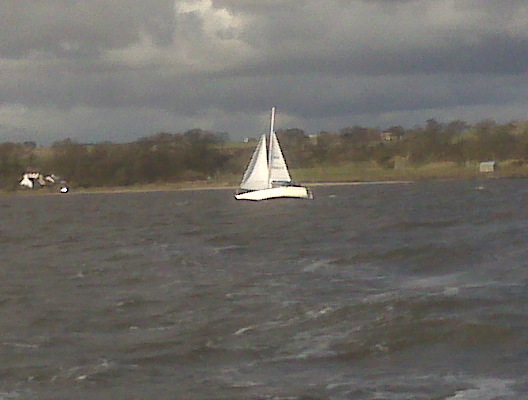 Good sailing to Blackness in a fairly strong breeze. Everyone went ashore for a quick pint before sailing back to Limekilns in lighter winds. 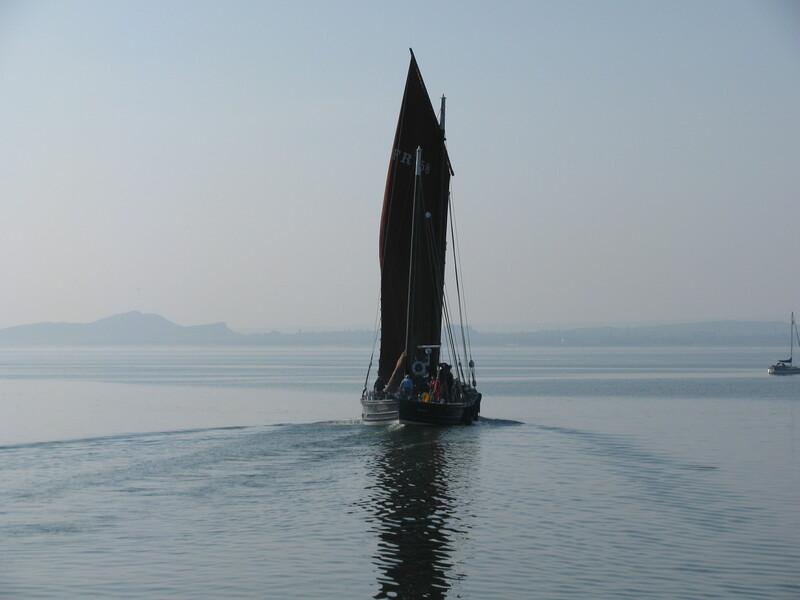 Forth Centaur was also out on the water and made the trip to Blackness and back without going ashore. 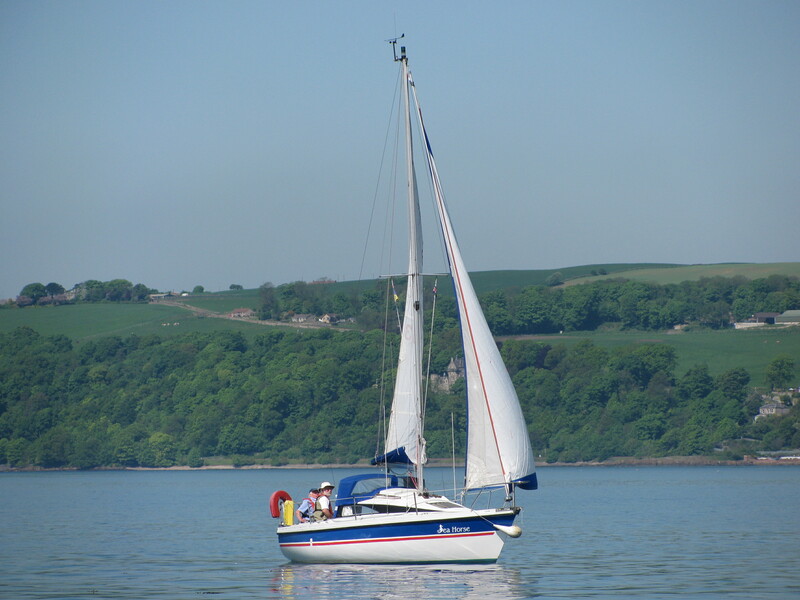 Five boats set out in sunshine and no wind motoring up river, around Bo’ness the wind picked up and excellent sailing was had on the return to Limekilns. It appears this was to be the last sail for the Carter family aboard Smuggler of Rhu having agreed a sale with their new owners, Sandy and Fiona, welcome to the club. Now it’s time to start the search for something else Gavin, exciting times. The “bring your own food” barbecue worked well and I believe everyone enjoyed themselves, our numbers were swelled by five visiting boats from Crammond who also made use of the barbecue and the bar facilities. Seven boats at Port Edgar for the Friday evening with five making the trip to Crammond, mixed weather from sunshine and no wind, wind and rain to rain and no wind. Typical Scottish weather, the highlight of the weekend for some was the sail in the rain to Inchcolm for others it was watching Michaela Strachan releasing ducks into the River Almond. A special mention to the friendly helpful members of Crammond club, thanks for the loan of the tender and for sending one of your members of to the Chinese for the take away food. A pleasant evening sail on board Joint Venture. 22nd Armagnac, Cordelle and Shere-Khan overnight in Anstruther. 23rd Four boats to Eyemouth motorsailing and motoring in SW winds force 4/5 rising to force 7 for Armagnac, Cordelle and Shere Khan’s arrival. Apparently a wheelhouse is the thing to have in these conditions. Entertained on Saturday night by Colin and his guitar in the pub. 24th Armagnac and Cordelle set off back to Port Edgar arriving after 11.5 and 10.5 hours respectively, great sailing up the coast towards Dunbar, motor-sailing as far as North Berwick and motoring to Port Edgar. 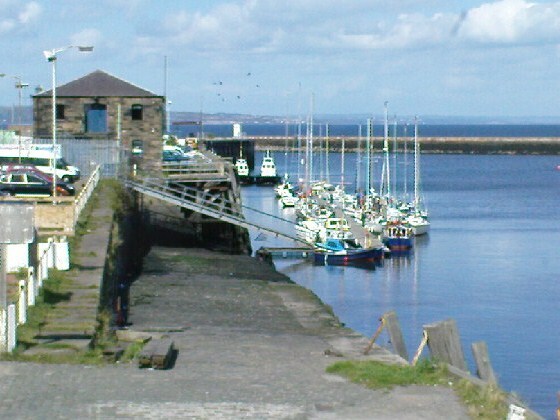 Yvana and Shere-Khan make the trip to Lindisfarne and back to Eyemouth, no-one went ashore due to tide and wind conspiring against them, barbecue and sing song back at Eyemouth. 25th Armagnac and Cordelle a short hop back to Brucehaven, Shere Khan a slightly longer hop back leaving at 6am from Eyemouth, Yvana returned to Port Edgar. Sunshine and showers, variable SW winds. Phil lasso demonstration. AB dropped a mooring line, Phil threw from the pontoon to three boats out and over the mooring the cleat. 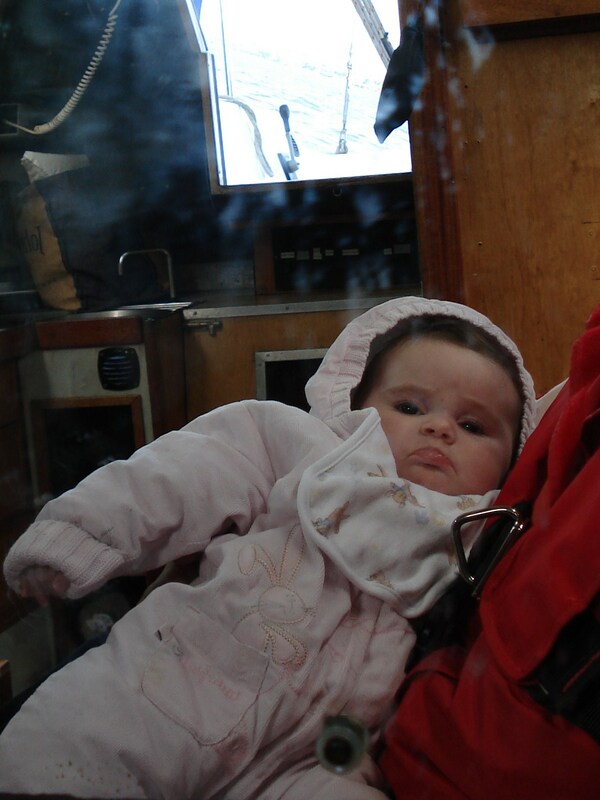 FH youngest cruise participant (6 months).